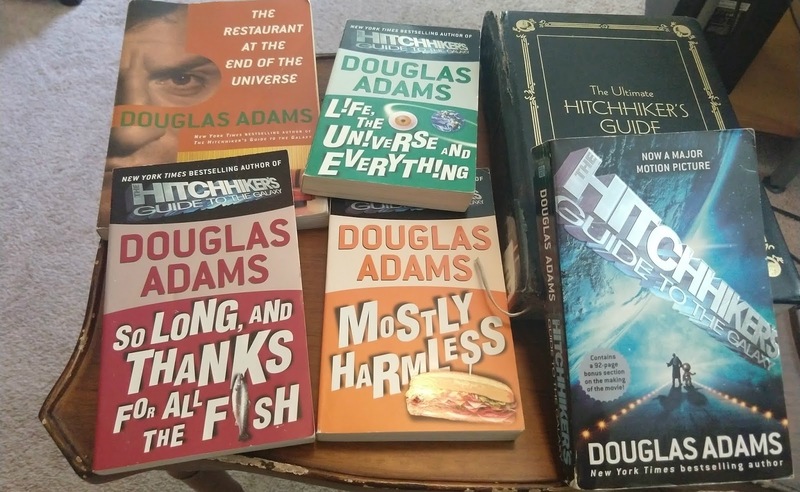 My sister gave me the book The Hitchhiker’s Guide to the Galaxy for my eighteenth birthday, just in time to see the film adaptation in theatres before it disappeared. For some strange reason, I liked science, and I liked fiction, but I didn’t seem to seek out a lot of science fiction. At the time, I didn’t watch Star Trek, Stargate, or similar franchises. I had heard of Douglas Adams books, but didn’t think I would enjoy them. They have since become my favorite books. The summer after graduating from high school, I went off to volunteer at a farm in Ceres, California. One of the first questions the fellow volunteer who drove me there from the airport asked me was whether I liked to read. I said that I didn’t, because it was true. But I still had four more Hitchhiker’s books to read, so I wasn’t going to let a little thing like my own personality stop me. We were given a break sometime later, and decided to take a weekend trip to San Francisco, which was where I bought the rest of the series. I was so fascinated by the brilliant writing that I couldn’t put them down but to work, eat, and sleep. I was even that weird guy at the party who went there with a book, which confused everyone who had learned that I was not much of a reader. This was the same party, by the way, that inspired some of the details of the story in my Dreams series called Man Planes, God Laughs. As I’ve worked tirelessly on my craft, and my canon, I’ve drawn inspiration from a number of sources, mostly television, but Douglas Adams books are part of that too. I love his wit, and I try to emulate it whenever I’m writing something humorous, or even just a little lighter. There’s that hypothetical question about which historical figure from all of time you would most like to meet, and Douglas Adams is my answer. Rest in peace, Mr. Adams. You were taken from us too soon.